Sometimes Solr search seems like an unfathomable black box; you plug in a few words and "magic" happens. Luckily, there are options to help you decipher what is going on behind the scenes, and give you control of your search experience. To begin debugging, you need to follow some steps first. Drupal 7: Install and enable both Devel and the the Solr Devel module . 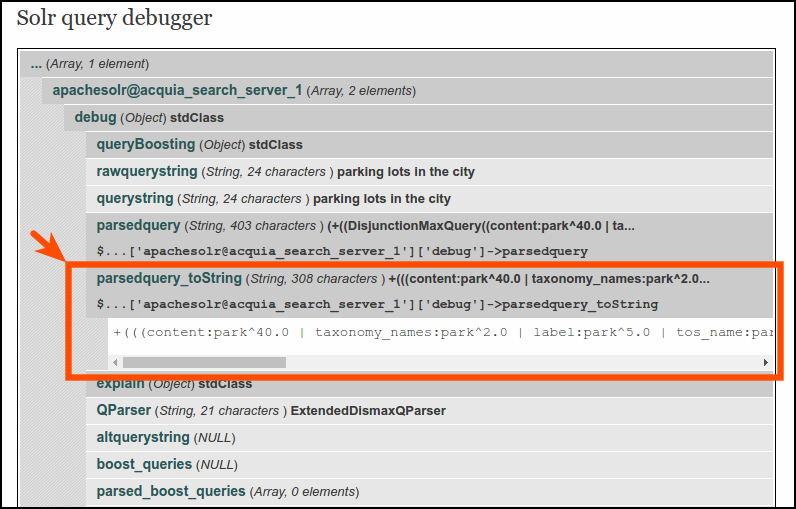 You may also need to manually enable and place the "Solr Query Debugger" block in a region visible alongside your search results. 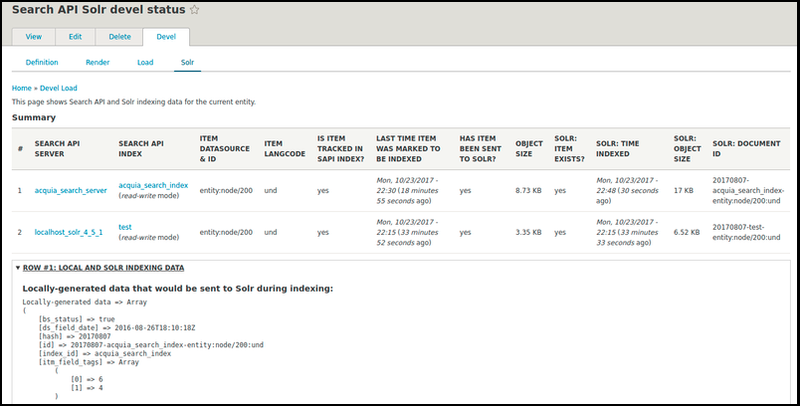 Part of the functionality needed is already included in Search API Solr module versions 8.x-1.2 and higher. (NOTE that Acquia Search currently only works with the search_api_solr-8.x-1.X versions). After this, you can debug in various ways. Read on for 2 example scenarios. Scenario 1: Why do search results have weird ordering or showing irrelevant items? You have a site for the local government of the City of Awesomeville. Also: the actual page titled Public Parking Lots should be first on the list, but it's not! Our keywords are being searched for within the Solr fields content, taxonomy_names, label and tos_name. The pipe ( | ) operator means "or", thus we are looking for word matches in any of the fields. Parking was converted to the lowercase, stemmed word "park"
city was converted to the stemmed word "citi"
Note that you control which fields to search across either in your View settings (Search API) or in your Bias settings for Apache Solr module. Additionally, modules can implement some hooks to add fields to search within at query time. In this scenario, we might reach the conclusion that Parking is actually being indexed and searched for as park. That makes your content about "Recreational parks" show up when searching for parking. So! To fix this problem, we probably need to protect the term parking by adding it to the protwords.txt file in Solr. HelloWorld would be split into the 2 words "hello" and "world", as well as indexed as the single "helloworld" term. ABC123XYZ would be split into 3 words: ABC, 123 and XYZ as well as the whole term. 1 or 2-character terms are dropped. 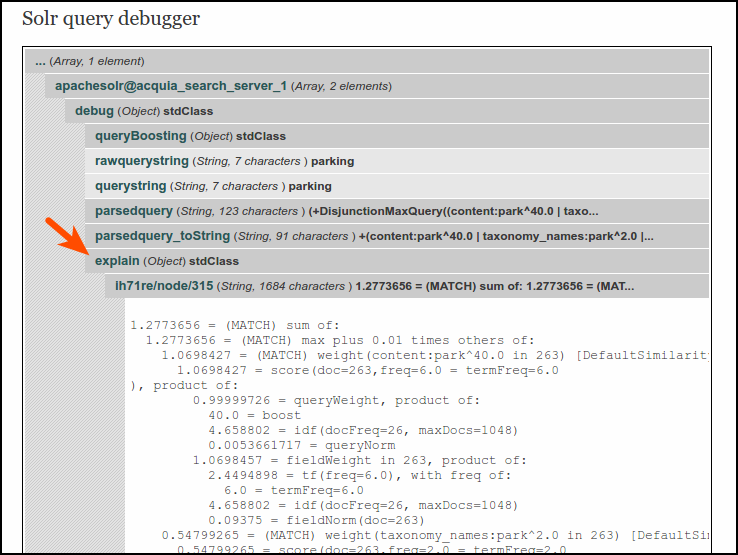 The Solr Query Debugger block also shows us useful explain information from Solr. We can use it to understand how a score is assigned to each item shown in the search results. One element for each of the entities matched and shown on the current search results page. The calculations done by Solr for each matching term/word, for each field, each generating a number. The total number (score) assigned to this entity by Solr. The explain contents include quite a lot of Solr technical terms and concepts which are beyond the scope of this document. However, you can learn more by looking at the Further reading section at the end of this document. Some things you can do that affect the above scoring calculations is discussed on our article Obtaining relevant search results. Scenario 2: An item isn't showing anywhere in search results. Why? Your site sells starship parts, and you have a page that sells a "2nd generation Warp Core NX-001-A"
Your customers are searching for "NX-001-A" but can't find this item at all! You can use the Devel > Solr Index tab that is shown on entities. If the item is not in the index, try re-saving it without changes. This should now make it show as "Queued for Indexing" and you can now index it normally. If re-saving doesn't get it queued, it's possible that module settings exclude this item from being indexed: you should check your index settings and confirm if some entity types/bundles are excluded, or if you have a module that avoids indexing certain items. Once we know an item does exist in the index, we can see what its data is like in the Solr index. Drupal 7: click on the Analyze Document option. 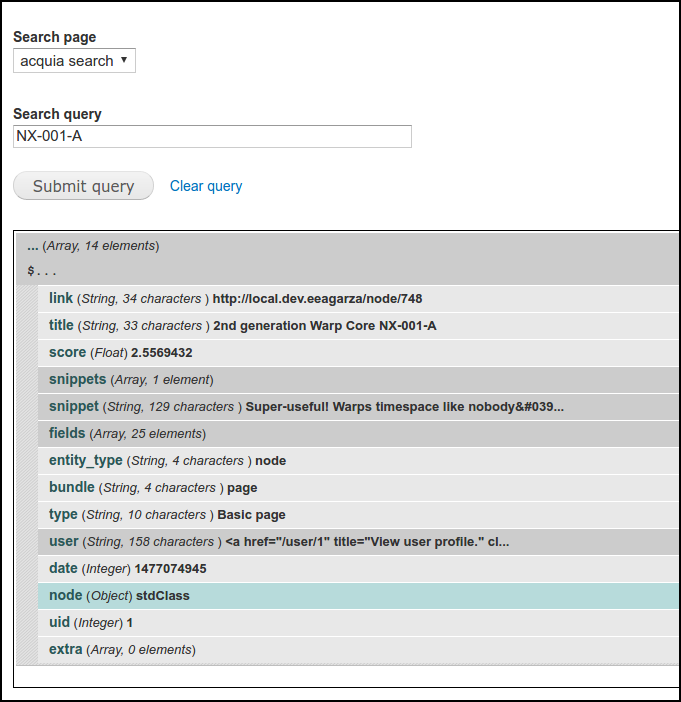 Drupal 8: click on Solr and Local indexing data. Note: This isn't available for Drupal 8 Search API Solr yet. Then use the Analyze Query option. This shows a query form where you can enter search keywords, and the form will respond telling you if that query will match the current entity or not. Lucene Tutorial: Scoring , Solr Scoring Tutorial and TFIDF.com Explain concepts like TF, IDF, queryNorm, boosts, and more.